Young authors and illustrators shared their book with schoolmates, hoping to inspire others to live with gratitude and empathy. Our young innovators remind us that age is not the key factor. Rather, it is a habit of paying attention to issues and ideas, and daring to act on them that makes a difference. Mohamad Syafriy Ilham and his schoolmates designed a foldable table for wheelchair users. Working in teams, students were challenged to brainstorm and prototype their ideas. A single thought was planted in the young minds of Mohamad Syafriy Ilham and his friends during a visit to St. Luke’s Eldercare Centre – how can we help the wheelchair-bound elderly carry out their daily activities more easily? During their interactions with the elderly, they observed how the conventional table design was incompatible with the design of a wheelchair, which was a great inconvenience. The thought didn’t leave their minds. With the guidance of their teachers, and a lot of hard work, a foldable table was born! It was designed to be attached to a wheelchair and adjusted to suit residents’ needs. Experiences like these, benefitting both students and the community, are the result of Applied Learning Programmes (ALP) on Innovation and Enterprise (I&E), such as this one at Chongzheng Primary School. Students are given opportunities to interact with people in the community, observe their needs and propose creative solutions to issues. Syafriy, who is now in Primary Six, shared that the experience had opened his eyes to see that regardless of age, he can help to improve the lives of others. Identifying a problem is easy. Solving it takes hard work and skill. At Primary Four, students at Qihua Primary School participated in the Make-The-Change programme, and were challenged to brainstorm solutions and test out their innovative ideas through a social campaign. Putting on their creative hats, they proposed posters, games and even products that could promote their social cause. 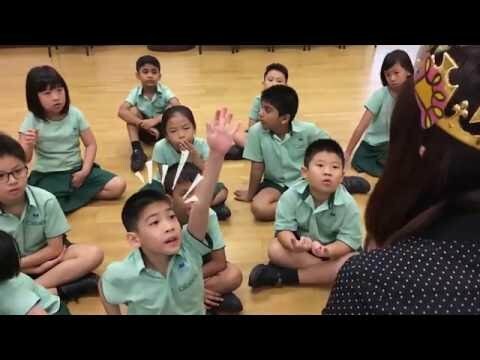 “I was excited to make a product with my group members and bring it to the elderly centre to get feedback,” said Primary Four student Chew Yee Yxuan. At Primary Five, they were introduced to product innovation and techniques for ideation. Some were guided further to execute their business and product innovations, which were submitted for competitions such as the Tan Kah Kee Young Inventors’ Award. One of the wonderful products developed by these young students was a memory card game designed for the elderly to keep their minds active. This Design Thinking process helped students to think through issues critically, learn to problem-solve creatively and dare to take action for the benefit of others. “My child is keener in finding solutions to the problems that occur in her daily life. She is also more observant and curious,” shared Mdm Noor Hayati Bte Haris, mother of a Primary Five student at Qihua Primary. “I’ve learnt the importance of teamwork. No matter how hard a task is, we need to persevere. When I grow up, I might need to work with other people I do not know. So I will need to learn how to work in teams,” said Primary Five student, Sharrwin Senthil Kumar. When you’ve delved deep into something that matters, one usually comes away with a changed mind and heart. As students interacted with the less fortunate, empathy was a life lesson that was caught. Inspired, Sriram Raghav and his schoolmates wrote and illustrated a storybook, Shoe Koala, which told a story of a Koala who learnt to put himself in the shoes of others. Sriram shared the storybook with his schoolmates at Chongzheng Primary, hoping that they would also live out the values of empathy and gratitude in their own lives. Unbeknown to him, his parents also felt the wave of his influence. They had observed the enthusiasm of Sriram and his friends as they worked together and shared the pride they felt in seeing the children become more responsible and active contributors of society. These young innovators remind us that age is not the key factor. Rather, it is a habit of paying attention to issues and ideas, and daring to act on them. Check out what’s happening in Secondary Schools as well, such as Broadrick Secondary School’s Innovation and Enterprise programme.